Are Hedgehogs Soft or Too Prickly to Hold? Are Hedgehogs Too Prickly to Hold? Many people who have never touched a pet hedgehog before wonder if hedgehogs are really prickly or spiky and if they are soft enough to hold. They wonder why anyone would have a pet that they can't even pick up or cuddle. But thankfully, hedgehog owners everywhere know that their beloved pets are definitely able to be handled if done so correctly. How Do You Handle a Hedgehog? When a hedgehog is calm, their quills are in a relaxed position. It is at this time that a hedgehog can be held without worrying about the sharp quills. The quills tend to lay down flat along the back and sides of the hedgehog, all pointing towards their rear end, so as long as you don't push against the sharp tips of the quills (pet them backwards) they pose no problems or chance of being poked. A scared or angry hedgehog is another story though since the quills are raised and tend to point in all directions. Trying to handle a hedgehog in this defensive posture is sure to be a prickly experience, and is usually only done with the aid of a thick towel or while wearing gloves to protect your hands. Do Hedgehogs Like to Be Cuddled? How much a hedgehog enjoys being held or cuddled is different for each one. It depends on the personality of the individual hedgehog and how much handling the hedgehog has had in the past. Some hedgehogs do seem to like to snuggle up to their human companions, while others might be shyer or simply prefer exploring and moving about over sitting still and cuddling. Some hedgehogs are tolerant of being held but prefer to snuffle around and explore (or find a quiet corner of the couch for a nap) over being held. It is hard to predict the personality of an individual hedgehog, though it is safe to say that with patience almost any hedgehog can at least be held. Hedgehog bellies are covered with soft fur but their sides and backs are covered with stiff quills. According to Hedgehog Central, a hedgehog is covered by approximately 7000 quills, so that makes them pretty spiky! These quills are sharp (though, unlike a porcupine's quills, they are not barbed) and are controlled by a series of muscles, so when a hedgehog feels threatened the quills are raised to stand on end. When the muscles are relaxed, the quills lay flat. In addition to making their quills stand up, the hedgehog will roll into a ball when they feel threatened to protect their soft undersides. This way all that is exposed is a hedgehog ball covered in quills (which makes an effective defense system). Even in this state, you can touch a hedgehog without too much damage (few hedgehog owners are ever poked hard enough to break their skin). 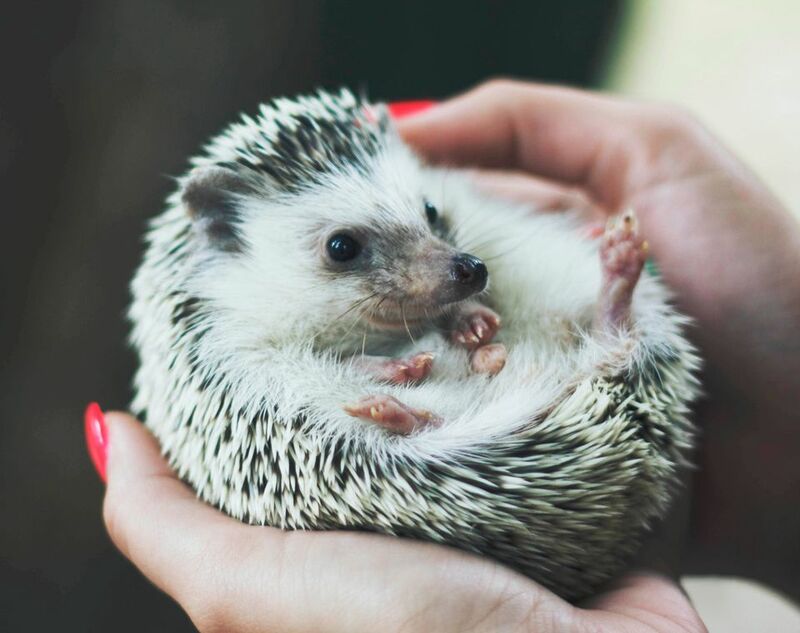 However, try to avoid getting your fingers trapped by a hedgehog rolling into a ball as they are strong and being squeezed and poked at the same time is sure to be painful for you!